Early implementation of proactive and predictive post-market surveillance allows MedTech companies to achieve a competitive edge. The historical role of post-market surveillance (PMS) has been reactive. It has focused on collating and reporting adverse events, such as device malfunctions or patient injuries, in order to trigger product returns, modifications, exchanges and recalls as necessary. However, as medical device complexity increases, PMS approaches will need to be more rigorous, leading to earlier detection of potential product failures in the field. Regulatory authorities are starting to emphasize the importance of PMS plans that are based on proactive data gathering and analysis, rather than relying on reactive data gathering once a serious post-market event has been reported. To meet these needs, manufacturers should take a risk-based approach when considering clinical and post-market needs. Examples include: infusion pumps (class II); implantable pacemakers (class III); and HIV diagnostic tests (class III). The EU Medical Device Directive (MDD) has always required medical device manufacturers to carry out PMS. Many manufacturers distributing CE-marked medical devices in the EU have not recognized the need for PMCF, and relied on the requirements in the January 2013 MEDDEV 2.12/1 Rev 8, which outlines the medical device vigilance system. This requires manufacturers to notify the relevant national competent authority about incidents involving a medical device, and any corrective actions taken. These processes are similar to those outlined in the FDA's Medical Device Reporting. Once the EU Medical Device Regulation (MDR) is in place this will change as the MDR mandates the need for PMS plans and PMCF. 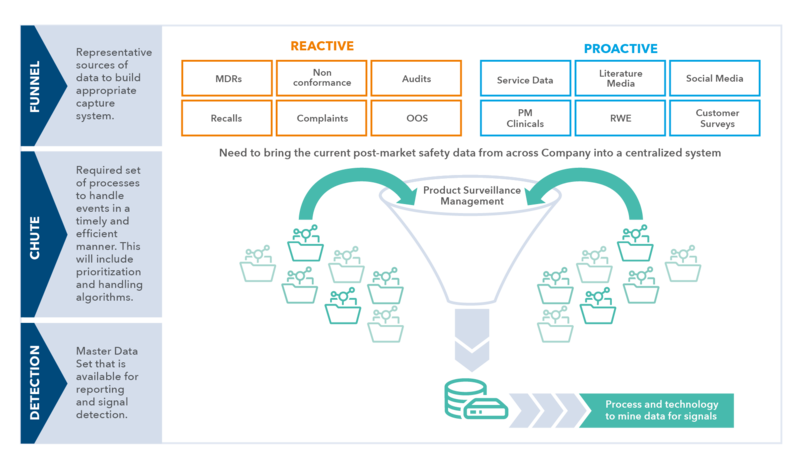 Many medical device manufacturers may not have the experience, expertise or resources to create a centralized safety function and proactive or predictive PMS. They may only realize its importance when faced with findings from regulatory authorities and notified bodies. By this point, the pressure to improve the PMS program is on and an accelerated effort to comply may be prohibitively expensive. Many medical device manufacturers struggle with the concept of a centralized safety function and a proactive or predictive PMS system. IQVIA has the experience, vision and systems to support manufacturers in identifying the needs and finding the most relevant solution for their organization. MedTech companies can achieve a competitive edge by early implementation of proactive PMS programs by heading off the tangible costs of down-stream field corrective actions and the very real intangible cost of customer satisfaction.